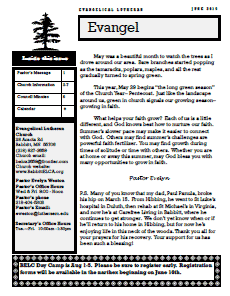 On the right is a list of our church newsletters (the Evangel) as PDFs. Download and read at your convenience. Clicking on the link should open the document in your browser or download it (depending on your settings). If not, you can download and install this program to handle the reading of PDFs on your computer. Download Adobe Acrobat. Sunday worship Holy Communion – 8:30 a.m.
Sunday school (age 3 through 9th grade, school year only) – 9:30 a.m.
Coffee ‘an – 9:30 a.m. Confirmation (grades 6-8+, school year only) - Wednesdays 2:30 - 4 p.m.
Like us on Facebook and get all our latest news there with pictures of the different fun activities here at Evangelical Lutheran. © 2019 Evangelical Lutheran Church of Babbitt (ELCA). All Rights Reserved.